Add Resource – Add a new resource, e.g. from the global address book or the InLoox address book. Edit and Delete – You can edit or delete elements (resources, tasks, but NOT projects) in the resource overview. 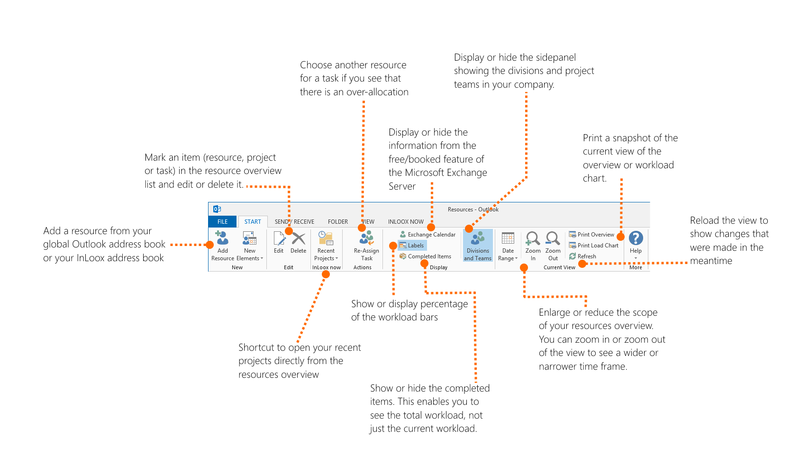 Please note Deleting a task in the allocation overview also deletes the task in the project. Recent Projects - Access your most recently opened projects directly from the workload overview. Re-Assign Task – If you see that a resource is over-allocated, you can relieve them by re-assigning the task to someone in the team who still has free capacities. 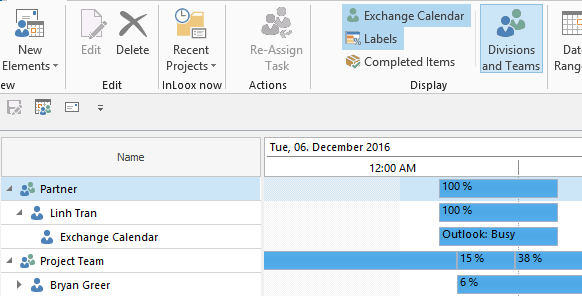 Exchange Calendar – You can show or hide the Free/Booked information from the Exchange Server. InLoox takes the Exchange calendar information into account when it calculates the workload. Please note The Free/Booked information is only available for internal resources, and only when you are online. The information is never available for external resources, neither online nor offline. 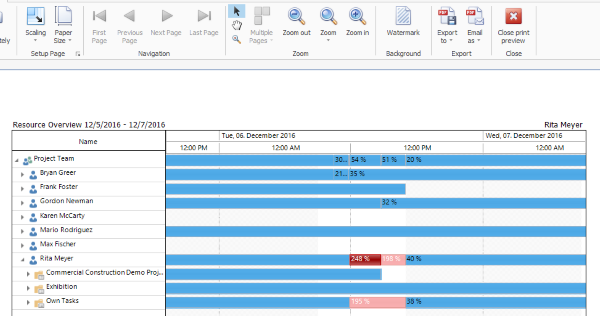 Labels – You can decide whether you want to show or hide the percentage of the workload next to the bars in the overview. Completed Items – You can show or hide tasks that have been marked as “Done”. By showing the completed tasks you will get an overview of the complete workload. If you just want to see the current and future workload, then hide the completed items. Divisions and Teams – You can show or hide the Divisions and Teams side panel. The side panel displays all departments in your organizations and the resources who work in the individual departments. You can also create individual cross-department project teams. Please note It is not possible to create new departments (Divisions) in the workload overview. You can create, edit and delete departments in the InLoox options, if you have the necessary administrator rights. You can also allocate resources to departments. Date Range, Zoom In and Zoom Out – Decide for which time range you want to see the workload (hours, days, weeks, months, quarters, years). The view of the resources and workload chart changes depending on the date range. Print Overview and Load Chart – Print the current view of the resources overview or the workload chart. Refresh – Click on refresh to apply all changes and to update the view. Selected allocation features | InLoox 9 for Outlook • Copyright 1999-2019 © InLoox, Inc. All rights reserved.